Donald Trump is retooling his campaign. This is a good thing. Through the most organized disinformation campaign in history, the lying media managed to browbeat Trump into acting like a “politician.” It’s led to him making boring policy speeches and echoing standard Republican talking points which the media simply ignores. While he’s fallen in the polls, that’s irrelevant at this point as the media emptied their clips into him and he’s only down two points according to John Zogby. Trump appears to have recognized trying to play on the lying media’s terms is mistake. That’s why he’s joining forced with Stephen K. Bannon of Breitbart and Fox News creator Roger Ailes to become the media and take his message straight to the people. This is a good choice, he’s being taken down by the lying media telling falsehoods about everything he says and taking it completely out of context. One of the latest media hoaxes. 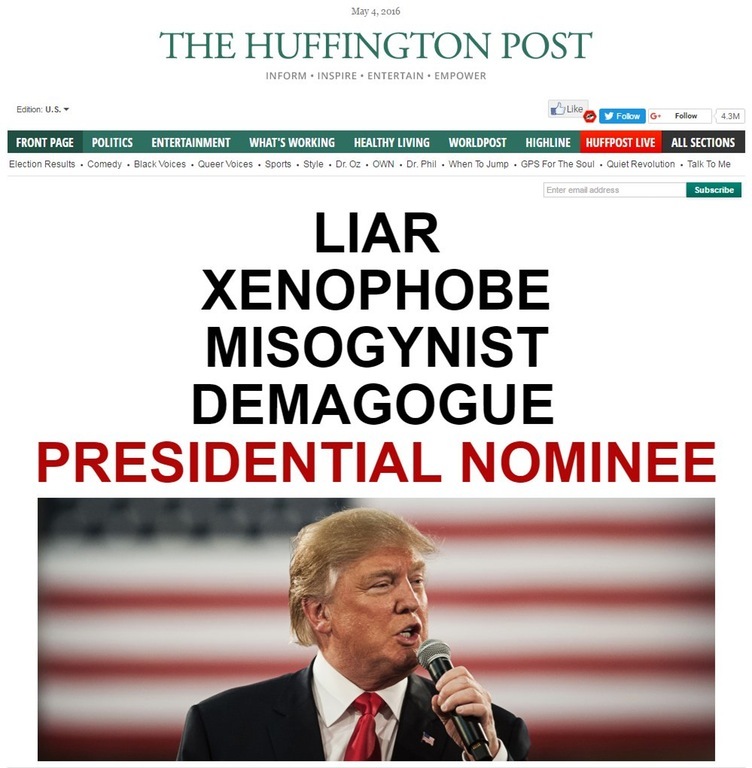 The entire controlled media has become The Huffington Post. Such insane demagoguery is now embraced by the entire controlled media. While leftist hysteria and lies have an impact, it’s limited. 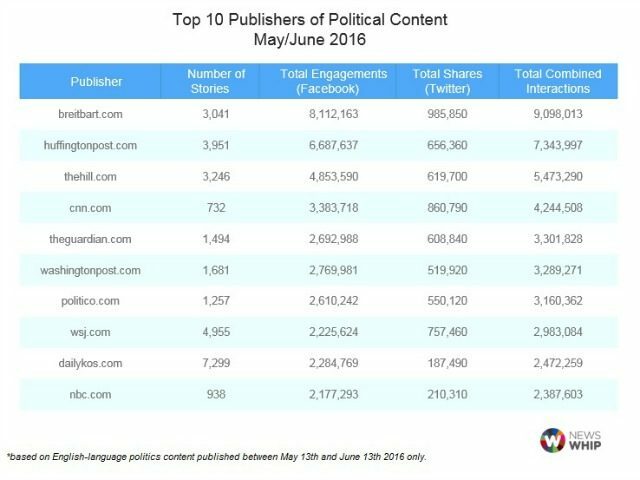 Breitbart, whom Trump is now joining with, overtook Huffington Post in terms of social media sharing in June. 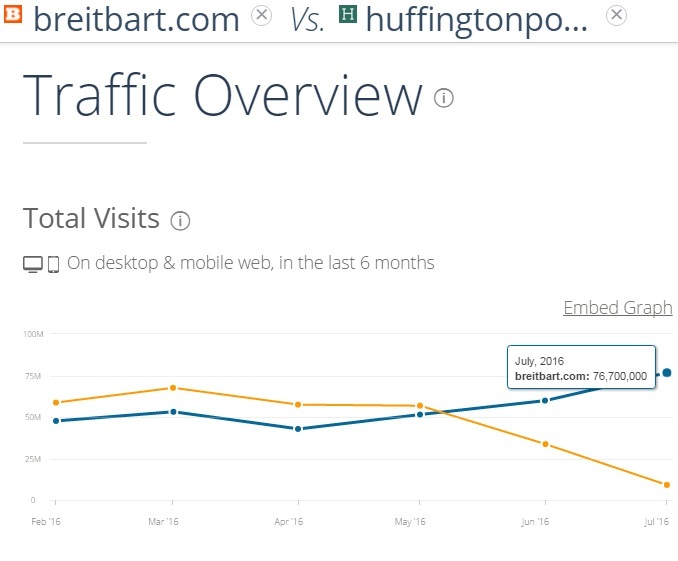 Huffington Post has been losing readers for months, yet Breitbart is exploding. Trump’s rise was due to his keeping his message simple. In his last policy speech on African-Americans, he said Hillary was a bigot and he will restore “law and order” in black communities. He said these poor black communities need “more police” to fight “gangs, the cartels and criminal syndicates terrorizing our neighborhoods.” Everything he said was reasonable and true, but I highly doubt it will sway any black votes. If they can be swayed, a simpler message is to tell them illegal immigrants and Mexicans are taking welfare meant for them. Trump was saying this type of stuff earlier on, but now he’s gotten bogged down in policy, which is mostly just a waste of time as it’s too complex for most Democrats to understand. Bannon can help Trump simplify his message once again and hammer such populist talking points home. Hillary’s entire platform is one of disenfranchising Americans in favor of foreigners and political elites, whereas Trump’s platform is one of populism and putting Americans first. It’s the most striking contrast in decades. His getting this message out is everything, Bannon will no doubt be of great help.